In my vision, the man brought me back to the entrance of the Temple. There I saw a stream flowing east from beneath the door of the Temple and passing to the right of the altar on its south side. 2 The man brought me outside the wall through the north gateway and led me around to the eastern entrance. There I could see the water flowing out through the south side of the east gateway. 3 Measuring as he went, he took me along the stream for 1,750 feet[m] and then led me across. The water was up to my ankles. 4 He measured off another 1,750 feet and led me across again. This time the water was up to my knees. After another 1,750 feet, it was up to my waist. 5 Then he measured another 1,750 feet, and the river was too deep to walk across. It was deep enough to swim in, but too deep to walk through. This morning went fairly to plan, we all got up and dressed and ready for work and school. Sean drove off to work, then Gabe trotted off to the bus stop, and just as I was helping Anna get her shoes on to head out to catch her bus there was a knock at the door. My head reeled as I looked at the clock, “Five minutes. Five minutes until the bus gets here” I told myself while tugging at my own shoelaces, “One thing at a time”. I gave Anna a once over with my eyes and then led her out to the bus stop in the corner of our yard. Those four minutes ticked away excruciatingly slowly. My husband was writhing in pain just a few yards away and there I stood making small talk with the neighbors over the children’s heads. “One thing at a time”. Another glance at the clock as I walked back into the house told me I had less than ten minutes to get to work on time, yet there lay Sean on our bed in more pain than I’ve ever seen him in before in our fourteen years of marriage – and there was nothing I could do. There was no explanation of his pain, nothing he had lifted or moved that had caused this stabbing. It just happened as he was driving to work causing him to stop driving, turn around and come back home. Which I might add has only happened twice in these fourteen years of marriage, one of which being today. To say I was terrified would barely cover it. His sudden reappearance at our doorstep this morning rocked me to my core. I didn’t know what to do, how to help, how to make him better. I felt so helpless, scared and…. well SCARED. This is my rock. He’s the one who lifts the heavy things, not me. He’s the strong one in this relationship. And yet there he was as weak as I’d ever seen him and I simply didn’t know what to do. “One thing at a time”. I scurried around the house finding the Advil and the glass for water, the heating pad and anything else I could think of to get him, I prayed. Not words so much, as soul groans deeper than words. Those sounds from deep within that make no human sense and yet spirits understand them completely. All day, I prayed from that place of no words, no sound really, only heart-felt pleas of mercy and assistance for someone I love to feel better and to not be in pain anymore. “26 the Holy Spirit helps us in our weakness. For example, we don’t know what God wants us to pray for. But the Holy Spirit prays for us with groanings that cannot be expressed in words. 27 And the Father who knows all hearts knows what the Spirit is saying, for the Spirit pleads for us believers[l] in harmony with God’s own will. 28 And we know that God causes everything to work together[m] for the good of those who love God and are called according to his purpose for them. 29 For God knew his people in advance, and he chose them to become like his Son, so that his Son would be the firstborn[n] among many brothers and sisters. 30 And having chosen them, he called them to come to him. And having called them, he gave them right standing with himself. And having given them right standing, he gave them his glory. 31 What shall we say about such wonderful things as these? If God is for us, who can ever be against us? 32 Since he did not spare even his own Son but gave him up for us all, won’t he also give us everything else? 33 Who dares accuse us whom God has chosen for his own? No one—for God himself has given us right standing with himself. 34 Who then will condemn us? No one—for Christ Jesus died for us and was raised to life for us, and he is sitting in the place of honor at God’s right hand, pleading for us. 35 Can anything ever separate us from Christ’s love? Does it mean he no longer loves us if we have trouble or calamity, or are persecuted, or hungry, or destitute, or in danger, or threatened with death? 36 (As the Scriptures say, “For your sake we are killed every day; we are being slaughtered like sheep.”[o]) 37 No, despite all these things, overwhelming victory is ours through Christ, who loved us. Ezekiel stepped into THE River of Life. He waded to his ankles, then his knees, then to his waist until finally the River was simply too deep to walk in anymore… but it was the perfect depth for swimming. Sit there and soak that picture into your brain. Imagine yourself dipping your toes into the refreshing waters of the River of Life and wading in up to your waist. Where are you today? Are you splashing on the shore line, swimming in the deep, or somewhere in the middle? Are you feeling dry and thirsty or wet and just trying to keep your head above water? Either way – you’re IN the River. Let it sweep you away with its current of Love. Let the water of His Grace lap at your toes and fingertips and curl around your body like silk only softer and more tender. If God is for us, WHO can be against us? NOTHING can separate us from the love that is in Christ Jesus, nothing! If you can’t pray because you’re simply too close to the situation, that’s OK! He has given us a River of Life that will flow from our bellies and it intercedes on our behalf with groans TOO DEEP for words. Stop trying to put things into words and simply let your heart do all the talking for you. He knows your heart. He knows your words before they’re ever on your tongue. He knows, because He cares for you; so make sure to remember that you CAN cast all your cares upon Him. He has broad shoulders; He can handle them so you don’t need to. After an hour long massage from my FAVORITE massage therapist, Diane Lawson, Sean is feeling MUCH better now. We’re pretty sure it was all the coughing he’s been doing, since he’s been battling a cold, that made his muscles spasm so dramatically. So if you feel like praying, we could all use some healing prayers sent our direction. Also, I would greatly appreciate your prayers for my friend Tammy and her family. Her mom has been in the hospital for about a week or so now with severe heart issues. She had surgery, recovered and was doing fairly well, but continued having trouble breathing. Then today she went into A-fib, while still at the hospital AND while her doctor just happened to still be in the building – coincidence, I doubt it, praise God! They moved her to the ICU and that’s the last update I’ve gotten on them so far tonight. So to say that their family is under a lot of stress at the moment would be an understatement! 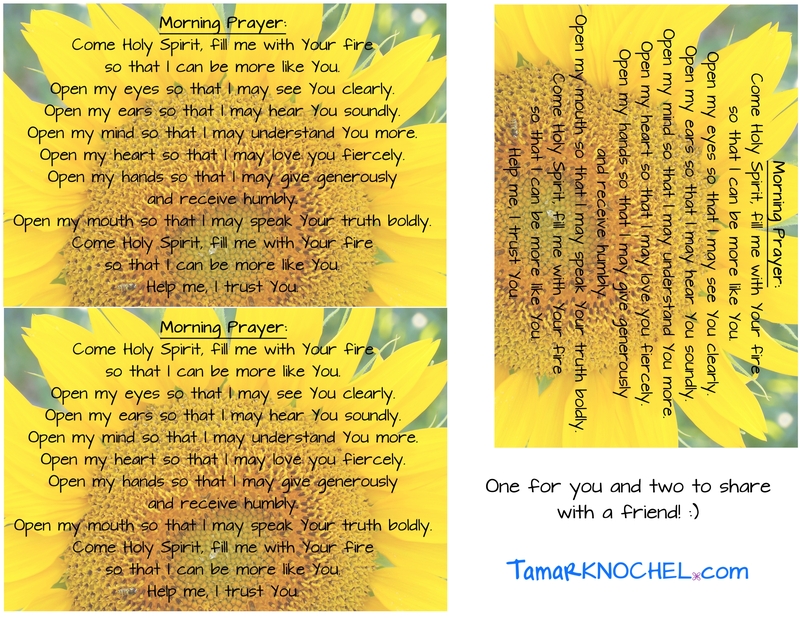 Tammy is someone who has prayed for you, probably more than I have even. So for you to return that favor on her behalf would be much appreciated.